They may be small but canapés and nibbles tend to be massive on the calorie scale. There’s no need to despair, there are so many delicious ideas that are low calorie which will taste just as good as their calorific cousins. a dollop of low fat cream cheese topped with a curl of smoked salmon, Parma ham or prawns. Mix drained tuna fish or white crab meat with a little low-fat mayonnaise or low-fat crème fraiche. Spoon a small amount onto each cucumber slice and top with a sprig of dill or finely chopped spring onion. Make sure you use fish that has been canned with brine rather than oil. Top the cucumber slices with finely chopped egg which has been mixed with low calorie mayonnaise. The same cucumber toppings can be served in tiny boats made from cherry tomatoes. Make sure you choose firm tomatoes that will hold their shape. Cut the tomatoes in half and scoop out the seeds. You can mix the seeds back into the filling if you like. These canapés look lovely on a platter alongside their cucumber counterparts. Melba toast is another great option for a low calorie canapé base. Each quarter slice of toast is only around 15 calories, excluding the topping. Start by removing the crusts neatly from a slice of bread. When toasted, take a sharp knife and separate the slice into two thinner slices. Now toast for a final time to give a crunchy finish. Cut into quarters and top with your preferred low-calorie topping. Prepare the canapés at the last-minute so the Melba toast doesn’t go soggy. Alternatively, serve slices of the toast with small pots of low-fat dip or spread. Soften some low-fat cream cheese in a small bowl and chop smoked salmon into shreds. Mix the cheese and salmon together, adding salt, pepper and dill to taste. 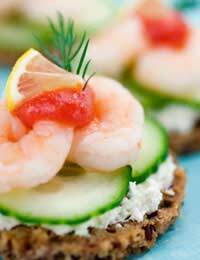 Spread the salmon mixture onto low-fat crackers or on tortilla wraps. If using tortilla wraps, roll tightly to form a neat sausage and slice into rounds ready for serving. Crisps are favourite nibbles but they are no friend to low calorie dieters. You can serve crisps with lower calories by making delicious vegetable chips which are much lower on calories but much higher in taste. Good vegetables to try are potato, beetroot, sweet potato, carrots and parsnips. Peel and slice the vegetables very thinly. To get a nice even result, it might be best to use a mandolin slicer if you have one. Place all the crisps in large polythene bag and add a few teaspoons of vegetable or olive oil. Toss and distribute the oil evenly throughout the vegetables. Lay the crisps on a baking tray in a single even layer. This means you may have to cook in batches but the results are certainly worth the effort. Bake the vegetables in a very hot oven for around 40 minutes, checking regularly to ensure they don’t burn. As the vegetables cook at different rates it’s best to cook the same vegetables together in different batches. Serve your oven-baked, low-fat crisps with a delicious dip. Try mixing plain, low-fat yoghurt with some chopped and deseeded cucumber and finish with a good sprinkle of fresh, chopped mint. Alternatively, chop some cherry tomatoes and mix with a little sweet chilli sauce and flaked chilli. Finish the dip with a good handful of finely chopped coriander. Go ahead and enjoy lots of nibbles without any of the usual guilt, the delicious low calorie options will keep your guests happy without missing any of the calories.